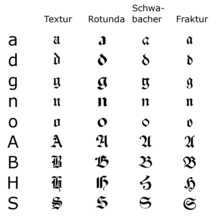 The Rotunda is a specific medieval blackletter script. It originates in Carolingian minuscule. Sometimes, it is not considered a blackletter script, but a script on its own. It was used mainly in southern Europe. One of the key differences between Rotunda and other blackletter scripts is that broken bows appear only in a few letters such as d.
The r rotunda (ꝛ), "rounded r", is an old letter variant commonly used in rotunda scripts and other blackletter typefaces. It is thought that this variant form of that letter was originally devised either to save space while writing on expensive parchment or for aesthetic reasons. The Unicode letter pair latin capital/small letter r rotunda rendered by different fonts. 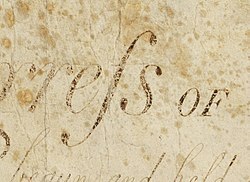 An italicized long s used in the word "Congress" in the United States Bill of Rights. The long, medial or descending s (ſ) is a form of the minuscule letter s formerly used where s occurred in the middle or at the beginning of a word, for example "ſinfulneſs" ("sinfulness"). The modern letterform was called the terminal, round, or short s.
There is a form of Italian blackletter known as rotunda, as it was less angular than in northern centres. The most usual form of Italian rotunda was littera bononiensis, used at the University of Bologna in the 13th century. Biting is a common feature in rotunda, but breaking is not. This page was last edited on 23 June 2018, at 21:58 (UTC).